FITNESS REALITY. Real People. Real Results. 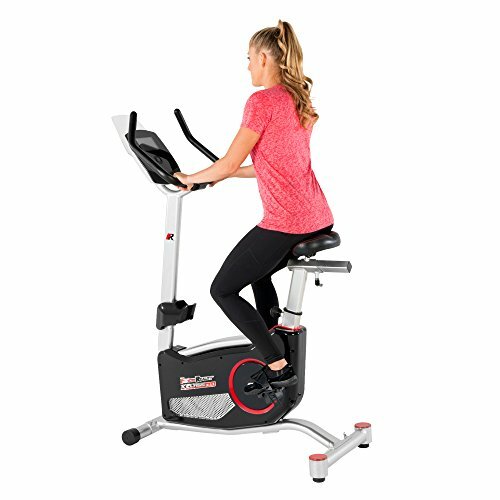 Get the same intense gym quality workout at home with FITNESS REALITY X-Class 310 Bluetooth Smart Technology Upright Exercise Bike with 20 Computer Workout Programs. Featuring a Smart Technology free app, 20 preset workout programs, 24 levels of magnetic tension resistance, and 3 workout goal options etc., FITNESS REALITY X-Class 310 can provide you a full body workout with all challenges you will need to get in shape. In addition, it also comes with an "Air Soft" seat providing extra comfort during long workout sessions. So get started and get the results you want with FITNESS REALITY X-Class 310 Exercise Bike. Additional Features: 300 lbs weight capacity. Easy to use 'sleek touch' activated acrylic console. 3 workout goal options (Calories, Distance, and Time). 3 Heart Rate Control (HRC) Programs. 2 Customizable workout programs. Store up to 4 user profiles. 'Quiet Drive' belt system allows noiseless and uninterrupted workout sessions. Highly visible Backlit LCD Console that displays Distance, Time, RPM, Calories burned, Speed, Heart Rate, and Watts. Free MyFitQuest app available on IOS to help tracking your workouts. Easy to use 4 way adjustable "Air Soft" seat for comfort during long workout sessions. User height range 5' to 6'4". Built-in tablet/smart phone holder. Upgraded 3 piece crank system prevents any maintenance issues. Listen to your music or movies with the embedded console speakers as you work out. Hand Pulse Sensors for measuring your heart rate and staying within your Target Heart Rate Zone. Transportation wheels for easily relocating or storing the bike. Large pedals with adjustable foot strap. Miles/Kilometers conversion option provided. AC power adapter included. Aux cable included. Water bottle holder included. Assembly required. Warranty: Frame - 5 years, parts and electronics - 1 year. Easy to Use 4 way adjustable "air soft" seat for comfort during long workout sessions. User height range 5' to 6'4"